2.5 starsThe Blood Key was tough to rate. While it does its best to stay away from stupid YA tropes, it's pretty much a convoluted mess.Official blurb:ZENA SKALA is freed from an asylum at age eighteen after serving time for a crime she didn’t commit—the presumed murder of her missing brother.Unwanted attention from the police and media ensues. Zena’s only hope resides in the deserted Skala Estate and memories from her odd past.Secrets await in her family home. Some more dangerous than others...What I liked:✔ The author's sense of humor:He walked toward us on the path. Bug butts flickered in and out of existence around his body, making him seem magical.✔ The kick-arse heroine who's not all about guys and romance. And this is a good thing since 99% of the book happens during two days' time. They share some intimate moments, but it's far from the he-loves-me-he-loves-me-not obsessed MC.✔ The lack of a love triangle. Yes!! !✔ The comic relief sidekick. Izzy is a mix of African American with Mexican roots, who always has a good line.Izzy shoved me from the right. "Don't you watch scary movies? The people that split up get dead, for real! "She's also a great support for Z, and pretty believable when hit with the most horrible situation (saying more about it would mean a pretty big spoiler).✔ The evil stepmother. Yes, this evil stepmother seems to actually have reasons and a heart (very deep down inside). True, she leaves Z in the asylum, but when things get really bad, she steps up. I actually kind of liked her (especially after Z's biological mother made an appearance).What I disliked:✘ The pacing. It was simply too fast. There was not enough time for things to be properly explained. They were barely getting out of a bad situation, before they got themselves into another.✘ The father. He was probably the most annoying character. In spite of being absent, he couldn't stop playing daddy dearest.✘ The cliffhanger. Yes, there's one, and if I had loved the book, I wold have hated being left like that.Bottom line is this was a nice book, and even if I don't think I'll pursue the series, you might like it. *Copy provided by the publisher via Netgalley in exchange for an honest review. I tried to like this one but... just couldn't. The plot was boring and the characters were acting like teens bordering on kid behaviour. Sorry, but not for me. I positively adore Vaun Murphrey’s Weaver series, and upon finding out she had a new book I jumped at the chance to read it. Of course, I was disappointed that it wasn’t the next Weaver book – I have so many questions I need answers to, so many events I’m excited to see play out – but I was intrigued to see what else she had to offer. For me, whilst the first book in the Wander series was an interesting read, it didn’t quite have the charm of the Weaver series. It was an interesting first book, enough to leave me willing to read the rest of the series, but it failed to pull me in as much as the Weaver series. In all honesty, you could say I was a little bit disappointed by this one. I’d expected something more of this, I’d expected a high like the Weaver series, and yet it failed to deliver quite what I had hoped it would give me. A fun read, but nowhere near what I know Vaun Murphrey is capable of giving. The Blood Key has such an interesting premise – our main character is freed from an asylum after false imprisonment for the presumed murder of her brother, secrets and lies at home, and a past looking to catch up with her. You’re not entirely sure what you’re getting involved in, but it sounds like a lot of fun. Having read Vaun Murphrey’s Weaver series I knew there would be many twists and turns, but I still wasn’t quite sure what kinds of twists and turns I would be given. Was this to be another science fiction read or would it be a contemporary read? The name suggested the latter, but the synopsis I read didn’t quite give the alien feel I knew from the Weaver series. It turns out, it is a science fiction read, but not quite in the same league as the Weaver series. I know, I keep referring to the Weaver series, and I do apologise for this. I only do this because the Weaver series is such a strong series, and works to show just how much Vaun Murphrey is truly capable of giving us. As I’m about the explain, The Blood Key failed to hit a few marks for me, and having read her other work I know she is capable of giving us so much more – leaving me with the hope that the rest of the series will fill in the gaps apparent throughout this one. First off, I’ll start with the story telling. Whilst enjoyable, certain parts of the book felt rather disjointed. There were many entertaining scenes – all kind of emotions were pulled at throughout the book – and yet there were times when things were not quite as clear as they could have been. I attribute this to the number of things that occurred throughout the book. So much happened in such a short space of time, that we bounced from one thing to the next at a rapid enough pace to leave you confused as to what was going on. Scenes would shift when we were still trying to wrap our heads around things, and whilst this does tie in with the main character’s lack of understanding, it made it hard to keep up with what was going on. More than once, I found myself going back to double check what was happening within a scene. Additionally, we didn’t find out quite as much about the alien worlds as I’d expected. We know about the big evil that will be present throughout the series. We know about the history, to a degree. We know a little about the different types of aliens. Yet, despite how much we came to see, I feel as though I know nothing at all about the alien worlds. I have more questions than answers. This is all good to leave me curious, it leaves me eager to read the next books, yet I would have liked to have a little bit more understanding. I would have liked to be able to form a better picture than what I currently have, as at the moment there are more blank spaces than I usually like to have. My final complaint is in relation to the relationships in the series. Whilst some were really enjoyable to watch, others felt too forced. The romantic element in particular, failed to do anything for me. I know Vaun Murphrey is capable of writing a wonderful romantic subplot, but for me it felt as though it was thrown in just to ensure certain scenes played out. There was potential for the romantic element, but in this first book it just felt a bit forced. As I’ve said, though, it was an interesting read. It opened up a lot of possibilities of where the series could go and has left me curious as to what is to come next – the ending in particular leaves you on the edge of the seat regarding where the story is to head next. I’m curious to see where things go from here, and my fingers are crossed that the next book lives up to the standard of the Weaver series rather than merely showing glimpses of what Vaun Murphrey is capable of delivering (honestly, there were some four star moments, there simply wasn’t enough for me to give a solid four star rating, hence this rounded down three stars). As a final note, I would like to thank NetGalley and the publisher for allowing me the chance to read this one. As The Blood Key starts the main character Zena, or Z is released from the mental institution she was placed in after being committed of killing her missing brother. She returns home with Izzy, an employee at the mental institute that became her friend, and strange things start happening start happening as they try to find out what happened to her brother. The plot of this is really a bit crazy! I don't want to give too much away but it's absolute non-stop, one thing after another action. I like the characters in it, Z is strong and self-reliant, she's not the normal sappy heroine that spends the book agonising over a boy. There is romance here, but Z is refreshingly forward about it and actually tells him that she likes him! Z's friend Izzy is an awesome character and I like the love interest Dom too.The disappearance of Z's brother is never explained, and there are very few answers to the rest of the questions the plot raises - what is Z, what are the powers she has and where does she come from. The story races from one action scene to another but never stops long enough to give us any answers. This looks to be the first book in a series, so there may be answers in future books, but there's a lot of little things that happen quickly and then are forgotten about. It would have been nice to see a bit more character development.This story definitely has potential, but I hope it slows down a bit so that I can keep up with it!I received a free copy from the publisher in return for an honest review. Received an ARC through NetGalley :)The plot seemed underdeveloped in the sense that the story moved on at a quick pace but without explaining much on the characters' situations, especially the main character, Bozena, as her questions regarding her background and abilities were left unanswered, all the way from the start till the end, which left me baffled. Countless attempts were made by Bozena to uncover the truth about herself but unfortunately they were not answered and the story just kept moving on. What I liked about this book though, was the relationships and bonds explored and exploited as the emotions felt by Bozena were clearly conveyed. There might be too much descriptive language to the point where minute details were unnecessary, but I have to admit that the background of the characters in the book was interesting. The paratactic style and lexical density of some sentences caused some annoyance, but all in all, give this book a chance because the locale set and the way the author explored Bozena's world was different and enigmatic. Netgalley copy in exchange for an honest review.Great novel, fast-paced and filled with actions, led by a strong, opiniated main character. The rest of her friends are very loveable, and they all have to stick to one another in the imbroglio of situations, twists and turns that this story has! It was easy to read and original, with brilliantly written world, as well as atmospheres. Zena (Bozena) Skala made me laugh out loud. Despite living in an asylum for years for a crime she didn’t commit (murdering her beloved brother), her sense of humor remains intact. Especially as she finds out that she’s not exactly human. Try dealing with that.I loved Zena’s character, and her process for learning way more than she wanted. Her love for her best friend, brother, and even her disappeared father is apparent yet she doesn’t hold back on the negative feelings that accompany loving someone for who they really are.It's not the tightest book regarding plot, and there are a lot more questions raised than answered, but it was a quick and fun read. There was a lot going on in a short period of time, and trying to make sense of it was a bit tough, but it was a good ride.I’ll read more from Vaun Murphrey for sure. The premise of this story is very interesting, especially the way it began. A girl with a spunky attitude who was locked away for something she never did? My kind of heroine. I like her best friend, who has a very funny personality but plays the role of a stereotypical Latina ... which I wish hadn't happened. There is a love interest in this story, and for once it isn't a love triangle, so that was quite nice. However, the plot itself seemed disjointed; so many things were happening and nothing was fully explained. I like having details in my novels, not just action, so that definitely made this novel suffer for me. I also found the dialogue to be awkward and stilted between the different characters, especially between Zena and her father. So while this novel had an interesting premise, its execution was lacking. If you like fast-paced stories with a lot of action, then give this book a go!I received this novel as an advanced copy from NetGalley in exchange for an honest review. Ugh. This book was full of potential... Shame I kept losing track of who was who, and who was what. Not enough back story, not enough explained, just fell flat for me.. I received a free ecopy of this book in return for an honest review. Many thanks to Netgalley and the publishers.I requested it on the basis of the title and the description. I haven’t read any Vaun Murphrey books before so I came to this book without expectations. As the story begins, Bozena is being released from a mental institute where has been for 3 years since her brother disappeared and she was blamed. Almost immediately, violent incidents start. Before long we learn of her origins and find out that she is special. On the face of it, this book has all of the usual YA genre tropes; the quirky best friend, the protective guy, the teenager singled out to do something important. What the book lacks is any level of character development. We don’t get to know (or like) any characters, even the main one. Bozena should be a mess of emotional conflicts but we don’t hear any of it. And then there are the aliens. There are aliens coming out of the walls at every turn. There are so many different kind of aliens with only the most cursory explanation of the differences. The book has incident after incident after incident, it is non-stop action but this does have an abrasive feel to it. I like a book that has peaks and flows in the action. I like the build-up in tension that structure creates. This book left me feeling mentally beaten into the ground, which is a shame because the premise had potential. If you are looking for a book with the usual YA fantasy with intense complexities of emotional conflict, you may not get what you need here, but if you are looking for a book that is all action and minimal feelings this would be the book for you. Well, I don't know exactly how to start this. Actually, I do. I like science fiction. I like the idea of aliens and all that entails. I played the crap out of Mass Effect. Anything with space and/or aliens coming to earth? Sign me up. Now, I haven't read anything else by the author, and if I'm honest, maybe if I had I would have liked this better. Maybe it's the writing style, the pacing - I just couldn't get into the story. That's not saying it's badly written - it isn't, not at all. I didn't catch any grammatical errors or anything like that, and the writing wasn't repetitive. The plot was just moving so fast I didn't know what was happening and when! I think the book takes place in two days. A LOT happens in that two day span. So much happens, and so very little explanation. If you like books that are nonstop action with very little to no explaining or world-building, then this book will work for you just fine. Me, I need more. Not too much, but more. The characters were okay. I couldn't really relate to the MC, Zena. She was 18, and she didn't sound like any other 18 year old I know. True, she's been through a lot and was just released from an asylum, but still. And the love interest kinda popped into the book right after her release and found a way to stay. Seemed a bit coincidental, that he claimed to be not human, like Zena. I really feel bad that I didn't like it more. I hate when I receive books through Netgalley, thanks to the publishers and authors, and I end up not liking the book. The cover is gorgeous, and the summary is cool. That's what drew me in. All in all it ain't a bad book. It seems a lot of other people like the author's other series, so maybe I'm the minority. Either way, I can't give this book more than 2 stars. Has so much potential...but I just couldn't get into it. Plot is too fast. Not enough explanation. The Dad character irritated me, and there were a lot of things unexplained (which I'm assuming will be explained in the rest of the series). Thank you to Netgalley, who provided me with a copy of this book in exchange for an honest review. 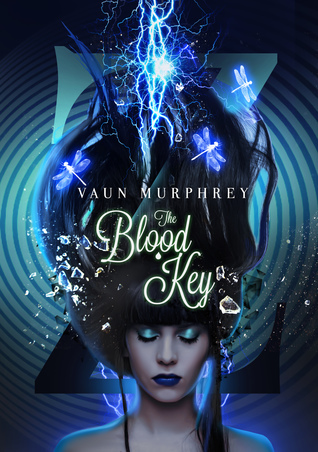 3,5* -- SOME MINOR SPOILERSThis is the first book I've read by Vaun Murphrey, and her writing voice instantly stood out. You know when you read the first few sentences and go "yeap!" because you know you're in good hands? I had that feeling.I enjoyed the tone of the main character introducing us to the story. There's a lot to like about Zena, but there's equally a lot to get frustrated about. She's a tall girl (Amazons represent!) and blase about things enough to be quietly sassy. She wasn't afraid to speak her mind often. For instance, what's the first thing you do when let out of an asylum and left unsupervised? Drink, of course. Especially if you have a dodgy family history.The main chapter I enjoyed with her was the flashback chapter (disguised as a dream which was kinda sneaky) introducing her brother Christophe - who, I admit, I was instantly drawn to. Vaun's description made him an early key player for Book Boyfriend 2017, not gonna lie. Dominic is equally nice, though a bit underdeveloped. And when the First Big Twist turns up in the first quarter, it seems to be skimmed over so quickly as though it's automatically integrated - not even Zena, who I'd imagine despite being casual about stuff having seen it all before would still be shocked and have some discernible reaction other than "ok gimme food" - and then we're moving on to the next plot point.While this book isn't perfect, I would pick up something of Vaun Murphrey's again because I did enjoy her writing, I just hope the pacing is more equal. GOOFY SCI FIThis scrapes in at a 3. I didn't dislike it, but it wasn't impressive. I was entertained by it but I was fine when it was over. I'm glad I read it but I don't need a copy. Zane/Z is freed from an asylum that she had been in since she was in there for three years Z had been falsely imprisoned for the murder of her brother who had gone missing. There were secrets and lies at home. Z comes home from the institution with Izzy who was a employee at the asylum but had become Z’s friend. Strange things started happening as Z and Izzy try to find out what really happened to Z’s brother and about Z herself. Z’s stepmother gave Z her childhood home with the stipulation that she never see Z again. On her way home Z interrupts a robbery and to one of her brother Christopher’s friends Dominic. Z and Dominic start spending time together. I kinda liked this story but wasn’t really impressed by it though I did finish it. I had mixed feelings about this story. I would have liked more background on Z’s abilities and her background. Z’s dad really irritated me. Some things weren’t as clear as I thought they should be. I also got confused a lot about what was going on. I also would have liked to know more about the alien worlds. There was a lot of drama and action. It was fast paced with a lot of twists and turns that I did like. This was a quick read and at times made me laugh. Still all and all I was disappointed. Vaun Murphrey - Vaun Murphrey lives in Lubbock, Texas with her husband, two sons and a shaggy black and white four-legged friend. Her life is composed of one ordinary day after another, at least from the outside – on the inside she travels to different worlds. If Vaun ever seems distracted, now you know why… be patient, she returns on a regular basis to visit Earth.